I’ve made chicken stock a number of different ways over the years. I’ve made fancy versions and herb versions and beyond simple versions. I’ve made chicken stocks with a ton of ingredients and chicken stocks with just two ingredients. This is the chicken stock recipe I make more than any other. 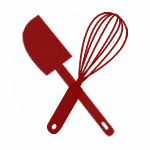 It’s easy and fast enough to make in a hurry and the flavor is so perfect that I make it even when I have ample time. Too many home cooks shy away from making their own stocks and broths because they assume it’s a time consuming or labor intensive process. Why do it when we have so many brands of canned and shelf-stable stocks of every kind and flavor available at the grocery store? The answer is easy: because homemade chicken stock tastes so good! There’s nothing wrong with canned stocks. I also use them from time to time and they’re convenient to keep around for when I run out of my homemade stash. That said, making your own chicken stock really is worth it. 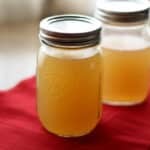 Homemade chicken stock is flavorful, savory and can be perfectly customized to suit your tastes. Got leftover chicken bones or the remains of a whole cooked chicken? Put it to work before discarding it to save on the cost of buying canned chicken stock from the store. I enjoy playing with different herb and spice blends in my homemade stock. I also love that I can control the saltiness level! Canned broths tend to be higher in sodium and often require me to think ahead and adjust the amount of salt called for in each recipe. With homemade broth, you can add as much or as little salt as you like or even omit it altogether. What’s the difference between chicken stock and chicken broth? They may seem identical at first glance but there are a few key differences. Stock is made from the bones or leftover carcass of a chicken. Chicken broth is usually made from the chicken meat itself. Simmering the bones to make stock extracts a different kind of chicken flavor and may result in a thicker fuller “mouth feel” than broth which runs thinner. 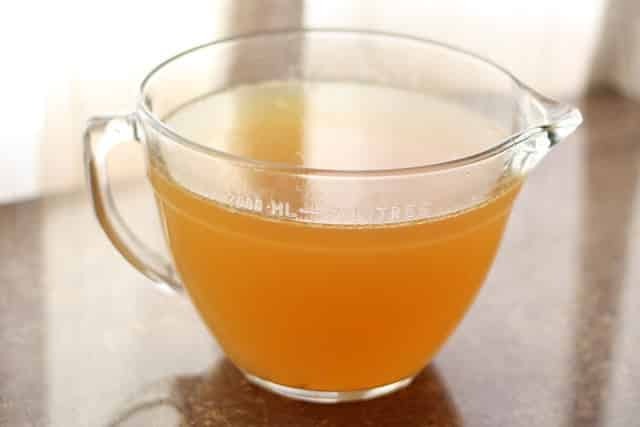 Broth tends to be lighter in color than stock and canned chicken broth is often much saltier. I use stock in all kinds of soups, stews, and sauces because I love the flavor. You can substitute broth for stock in most recipes and visa versa but keep in mind that it might affect the flavor and texture slightly. Call me lazy, but all you really need to do to make chicken stock is add water to chicken bones and let it all simmer. I’m listing optional ingredients below, but feel free to just add water and leave it at that! Adding a few vegetables to your stock as it simmers can add a ton of delicious flavor. My favorites are carrots, celery and onions and I sometimes add parsley too for a little bit of herbiness. Thyme and rosemary are other great additions to your stock if you’re looking for more of an herbed flavor. Peppercorns can add a little spice. Feel free to play around with different combinations each time you make this homemade stock. This stock can be simmered for just a couple of hours or for as long as 24 hours. It can be made on the stove-top or in the crock-pot. Chicken Stock is a fantastic recipe to make in your crock pot or other favorite slow cooker. I’m always in favor of recipes that don’t require a ton of fuss or monitoring and this one definitely fits the bill. To make homemade chicken stock in the crock pot, simply toss all the ingredients in the slow cooker and let it cook on low (or simmer) for at least 8 – 12 hours. I’ve even left it in the crock pot for 24 to 48 hours! All you need to do while the stock is simmering is check the pot every now and then to make sure the stock isn’t running too dry.You know your stock is done when the color turns a rich golden brown. The texture will be slightly gelatinous and may become more so as it’s cooled. Other than the occasional check in, you can go about the rest of your day and have a batch of delicious homemade chicken stock with hardly any effort at all. If you have never made your own chicken stock, don’t be intimidated. It really is simple enough for anyone to do. You can always add spices, salt and pepper after the stock is made, when you are ready to use it. Chicken stock is a staple ingredient for home cooks and I use it in tons of recipes including Chicken with Mushrooms, Chicken Marsala , and Chorizo Lentil Soup. It’s a great way to add moisture to homemade bread stuffing and as a base for almost any kind of soup you can imagine. 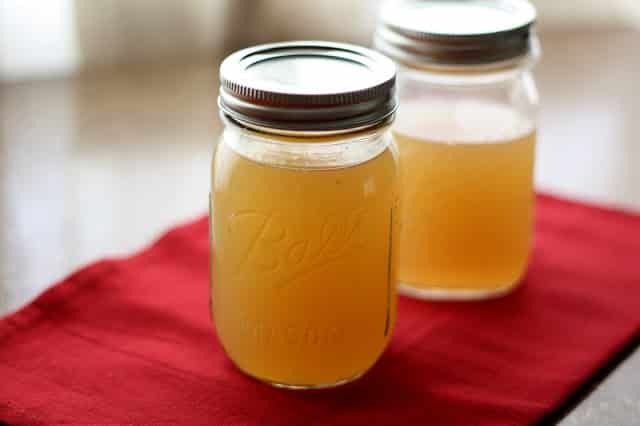 The uses for homemade chicken stock are endless! This is the stock I make more than any other. Place the chicken bones and chicken skin along with any optional ingredients in a large pot and cover with plenty of water. Bring to a boil and then reduce the heat to a low simmer. Simmer for about 2 hours. The stock is done when the water turns a deep golden color. Crock-Pot Directions: Place all ingredients in the crockpot and simmer on low for 8-12 hours. You can simmer it as long as 48 hours as well. Simply check the level of liquid periodically and add water as needed, so that the stock doesn't go dry. Pour the stock through a strainer into a large bowl or pitcher. Let it cool in the refrigerator overnight. When it is cool, skim the top layer off the stock and discard. It should now be thick and gelatinous, similar to egg whites or loose jello. Transfer to jars and store in the refrigerator for up to a week or in the freezer for several months. Would you believe I've never made homemade chicken stock! you have inspired me to get going - you make it sound easy! I'm guilty---I never make my own chicken stock, but our idea of letting the crock pot do the work really interests me, I'm going to try it. Part of my problem is that I don't cook a lot of whole chickens, so no carcasses. Can you make stock out of just random leftover chicken bones? This is the way i've been doing it. Good to know that I'm not doing it wrong. I always feel bad throwing bones away so I save them anytime I can for all kinds of stocks. Sometimes I even keep my shrimp peels for shrimp stock. The crock pot is a neat idea. I always knew there had to be an easy way to do this instead of buying cans upon cans upon cans at the store! Thanks for sharing! I am a waste-not-want-not cook. Whenever I have chicken bones, skin, wing tips etc. I throw it all in a ziploc in the freezer. When it's full, I do the stock. Sometimes if I have veggie scraps I'll throw them in too, but usually it's just the chicken. I like to brown the bones and bits on a cookie sheet before throwing into the stockpot- toss the bones and skin etc. on a cookie sheet or roasting pan at 350 for 20 minutes to a half hour, till you get lots of those yummy brown bits on the pan. Then scrape it all in to the water and simmer it for stock. You get a deeper color and richer flavor, and it's super easy. And nothing gets wasted. Wonderful idea! Never thought about it but LOVE the crispy chicken skin on baked chicken or turkey! !